aware of the four noble truths. That person, I describe as a brahmana. There is no doubt that Ms. Maywati has given her people a history just by spending 1% of the budget for creation of monuments and parks for icons of Bahujan (majority people belonging to they so called untouchables, and other backward castes) leaders who are the real Buddhists.Otherwise the country would have had only non-Buddhist icons memorial where huge amount is spent every year for their maintenance. This is not tolerated by the haters of such Bahujan leaders. When Ms mayawati becomes the Prime Minister, more such monuments have to come all over the country. In a democracy, leaders of the majority must also be honored. no body can stop this including the foreign press and the media. Ms Mayawati is creating history and she is part of it. (of ignorance), and who knows the Truth. to the bank of the Aciravati River and there they filled up a cart with sand. ignorance), and who knows the Truth. 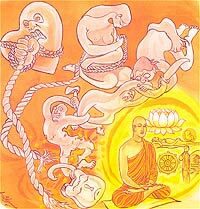 At the end of the discourse five hundred bhikkhus attained arahatship.